There are buckyballs in space. 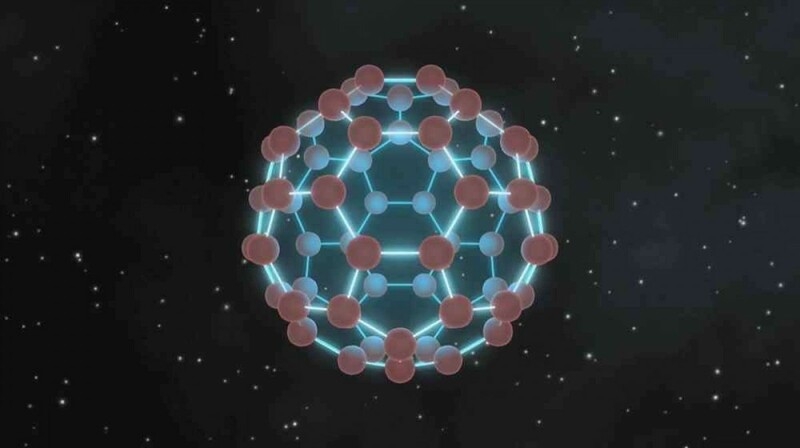 More formally known as fullerenes, these carbon molecules such as C60 have long been known to exist in space due to the complex chemistry that can occur between gas and dust in interstellar clouds. But we now know fullerenes can help explain one of the nagging mysteries of astronomy known as diffuse interstellar bands. Diffuse interstellar bands are absorption features seen in stellar spectra. While many absorption lines can be identified with particular atoms or molecules, DIBs don’t have a clear identification. But two bands in the infrared (at 958 and 963 nanometers) were thought to be caused by C60. Now a paper in Nature confirms this hypothesis. In this work, the team looked at the spectra of buckyballs when cooled to about 6 Kelvin (a common temperature for interstellar clouds). They observed absorption bands 963.27 ± 0.1 and 957.75 ± 0.1 nanometers, in good agreement with the interstellar bands. So that’s two DIBs identified, and a few hundred more with origins yet to be discovered. My favorite fullerene is Carbon70. Carbon60 is the most common, and is a truncated icosahedron (soccer ball). When fulleres were first discovered, I noticed the large spike of C60 on the screen of the mass spectrometer. I also noticed a smaller but significant spike for C70. I wondered about this for years, but failed to imagine it’s geometry. Perhaps a decade later, I heard that Dr. Richard Smally, (Nobel Laureate in Chemistry for his discovery of fullerene) was lecturing at Brookhaven National Laboratories. I drove 5 hours in a raging storm to attend his lecture, and after, I had the honor & privilege of speaking with him. During our conversation, I asked him about my fascination with C70 and he described it for me. I was delighted. I drove 5 hours back home, but the experience was worth it. Sadly, he died a few years later.